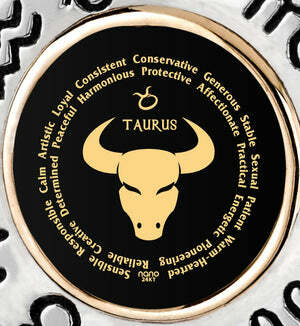 A guy who will take up a heavy burden to reap the rewards in the future, who enjoys the finer things in life but almost never to excess, and who doesn’t get phased by petty things in his life but has no qualms about charging forward to seize his opportunity – that’s the Taurus beloved and respected by so many. Luckily, he’s also no stranger to wearing fashionable jewelry, so an original mens sterling silver pendant like this one is the perfect mens gift idea to excite him with! 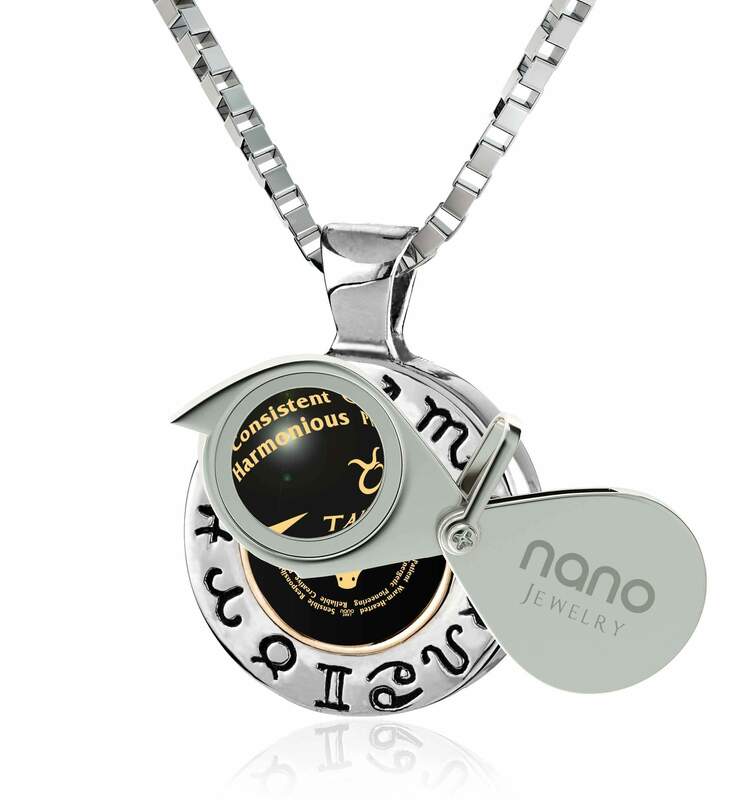 Among our newest and most elaborate designs, this innovative piece of daring Taurus jewelry sports a mixed metal design coupled with remarkable technology only Nano Jewelry commands. 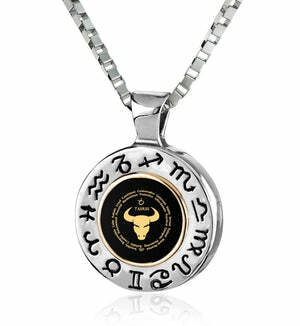 925 sterling silver is exclusively used in fashioning its box chain and round frame bedecked with all twelve zodiac symbols, while the inner ring which separates the frame from a highly polished onyx stone is 14k gold. That purity increases to a full 24 karats when you get to its main feature, a richly detailed inscription showcasing a handful of Taurus’ endearing personality traits, the head of a proud bull and the horned Taurus symbol. All of these are smaller and more vivid than anyone else worldwide can make them, so you’re essentially giving a Taurus gift no one he knows possesses. 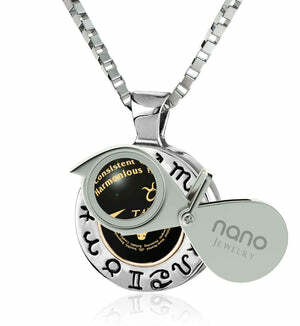 The cool necklace for men harbors many secrets worth uncovering, and he’ll have a fun time doing so with our practical magnifying glass. 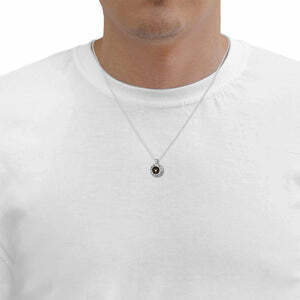 When he isn’t using it to explore the great gift for him you’ve given, it can always rest on his keychain. 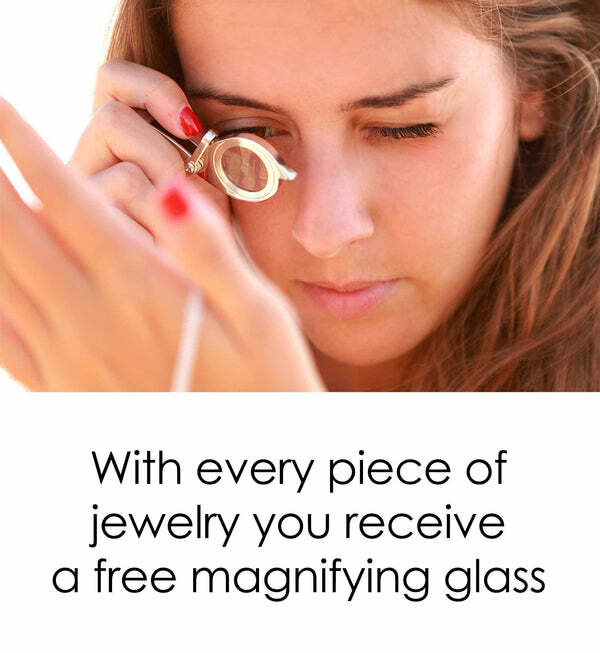 To wrap things up, or rather kick them off since it will be the first thing he sees, both the glass and the necklace are packed inside a fine-looking jewelry box which only adds to the gift’s prestige.